Masthead sloop with adjustable backstay and runners. Boom furling system has recently been re built. The wheel shown is the cruising wheel, there is also a larger diameter "Regatta Wheel"
Saloon settee converts quickly into an additional double and there is also an additional single berth cabin aft currently used as storage. 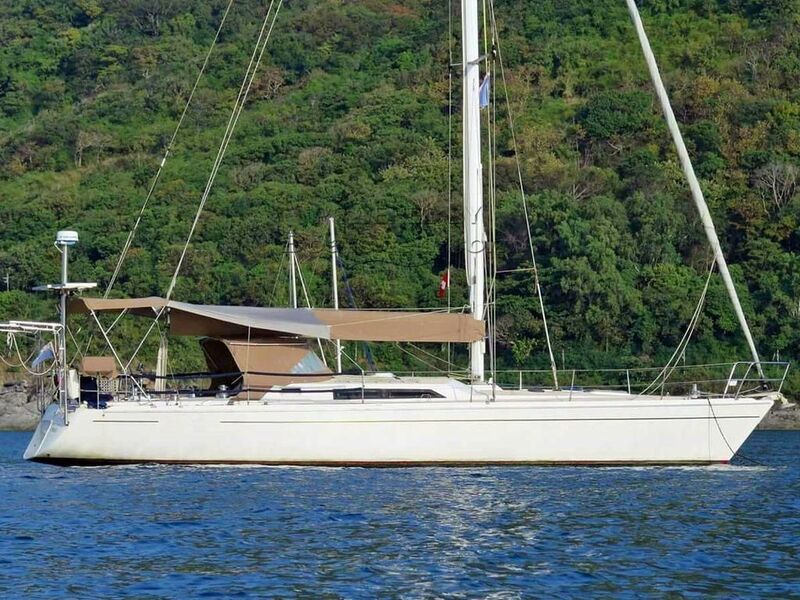 This Northshore 46 designed by Hank Kauffman and built by Northshore Yachts Sydney is a safe and comfortable cruising boat and a capable offshore racer, with her lead keel and centerboard, she can also get into those shallower and more sheltered anchorages. Her boom furling makes sail handling a breeze and she has been predominantly sailed single handed by both her current and previous owner. Comfortably sleeping 5 in two doubles and a pilot berth, the saloon settee converts quickly into another double and there is also an additional single berth cabin aft currently used as storage. A major refit in 2017 including, new mast & rigging, interior upgrades, high output solar panels,electric head, New Furuno instruments and much more. Many recent upgrades and additions. This Northshore (Australia) 46 Centerboard Sloop has been personally photographed and viewed by Alan Giles of Boatshed Phuket. Click here for contact details.